Statements made by Sydney Rabbi Moshe Gutnick have reignited a commitment to Judaism for child sexual abuse victim Manny Waks. 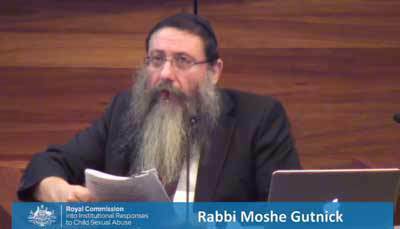 Waks, who co-founded the child sexual abuse advocacy organisation Tzedek was present at the Royal Commission into Institutional Responses to Child Sexual Abuse hearings in Melbourne today when Rabbi Gutnick’s statements came under the scrutiny of counsel assisting the enquiry. He told the Commission that “pretty much all the rabbis were members of the Organisation of Rabbis of Australasia”. The discussion was focused on a man codenamed AVL a rabbinical student who qualified as a rabbi but who fled Australia. Rabbi Gutnick was asked if AVL could call himself “rabbi”. He said that he could bu did not think that he did. Maria Gerace then took Rabbi Gutnick forward to 2011 and the sexual abuse committed by David Cyprys at Melbourne Yeshivah. He said he heard about Cyprys through the media and said that the news had come as “a big shock”. He then read from his statement about a series of emails circulated through the ORA members discussing child sexual abuse. He said: “In July 2011, there was a series of emails that circulated amongst the ORA membership in which the response to child sexual abuse was discussed. The discussion was initiated by Rabbi Yosse Feldman. AT the time he was the president of the Rabbinical Council of NSW and the treasurer of ORA. He is my nephew. In the emails, I expressed the view that allegations of child sexual abuse must be immediately reported to the police. This remains my view. I felt that reporting was literally a matter of life and death and that none of the laws of Messirah [the ‘crime’ of reporting incidents or crimes within the Jewish community to the secular authorities] apply to the reporting of abuse to the police. However, Yosse argued to the contrary wand was outspoken in the emails.” He said that it sparked a debate within ORA culminating in the issue of a public statement advocating reporting child sexual abuse incidents to the police. Maria Gerace highlighted an email from Rabbi Yosse Feldman expressing the view that “each child sexually-abused” should be taken to their rabbi first before a decision is taken whether or not to report the matter to the police and asked Rabbi Gutnick “What do you say about that view?” He answered that he believed it to be incorrect. In his statement he said that he was not aware of any rabbi who was competent enough to make the dicision. At this point the topic of being a Mosser was raised…that is anyone who reports a child sexual abuse incident to the police. Rabbi Gutnick said that “I absolutely reject that.” Dealing with Mesura Rabbi Moshe Gutnick said: “I believe it is an absolute religious obligation to report any allegation of child sexual abuse as quickly as possible to the appropriate authorities.” He said that any religious-based suggestion not to do so would be “an abomination”. 1. We reiterate our condemnation of all forms of child abuse. 2. We reiterate that there is no halachic impediment to convey all credible information about such matters to the police or relevant authorities. To the contrary, it is halachically obligatory to do so. 3. This obligation to mandatory reporters bit to all who have become aware that abuse has taken place. This statement made is 2011 prompted the boy who called Rabbi Gutnick in 1987 to call him again creating for the rabbi “a life-changing experience”. He was reminded that following the publication of his statement a 74-yr-old woman from the Gold Coast contacted the rabbi to tell him she has been abused while studying for her Batmitzvah. And that she had carried the secret with her for her entire life. He added: “To perpetrators I say – you will be found. There will be justice. If not in this world, most definitely in the next. Turn yourselves in.” He added there is no statute of limitations in Jewish law for crimes like this. He later referred to the curriculum of those studying for the rabbinate telling the commission that there were no courses to deal with sexual abuse that he was aware of. The previous day Zephania Waks, father of Manny Waks who played a major role in making the authorities aware of the child sexual abuse in the community, had told the Commission that his syangogue had refused to give him aliyas at the appropriate time. Rabbi Gutnick was asked if customary aliyas were ‘uniform and routine’. He agreed that it was “very rare to refuse an aliya”. He also stated that it was “extremely rare” for a rabbi to preach against someone in a sermon.